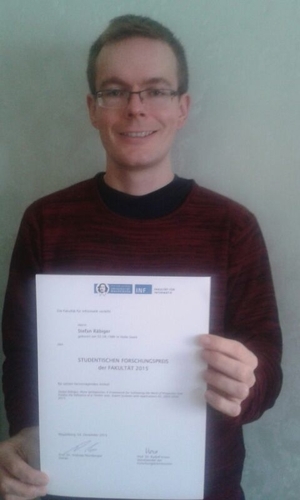 Stefan Räbiger is the recipient of the award "Studentischer Forschungspreis 2015" for the paper "A Framework for Validating the Merit of Properties that Predict the Influence of a Twitter User", which was co-written by Prof. Myra Spiliopoulou. It was awarded by the faculty of Computer Science of the Otto-von-Guericke University. The paper is based on his master's thesis which was also supervised by Prof. Spiliopoulou. 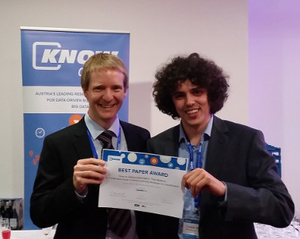 The KMD group is happy to announce that the paper "How to Select Information That Matters: A Comparative Study on Active Learning Strategies for Classification" by Christian Beyer, Georg Krempl and Vincent Lemaire has won the Best Paper Award at this year's iKnow (15th International Conference on Knowledge Technologies and Data-Driven Business 2015, Graz, Austria). Mrs. Nedime Tugce Habip, student of the Master Digital Engineering, is the recipient of the 2015 award "Otto-von-Guericke-Stipendium". 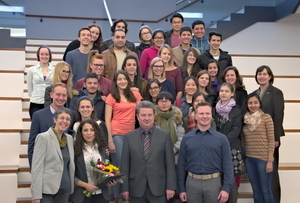 The city of Magdeburg gives this award since 2003 to international students with excellent academic performance and social engagement. Next to her superior performance in her studies, Mrs. Habip engages in mentoring international students from the Master Digital Engineering and Master Data & Knowledge Engineering degrees and in further social activities in the University and in our city. Mrs. Habip was nominated by the studies coordinator of the Master Data & Knowledge Engineering, Prof. Myra Spiliopoulou. Myra Spiliopoulou gives a tutorial on "Medical Mining" at KDD 2015, Sydney, Australia, together with Ernestina Menasalvas (Univ. Polytecnica de Madrid) and Pedro Pereira Rodrigues (Univ. Porto) on Monday, August 10, 2015.